Whitby Town return to action with a trip to Halesowen on Saturday, before visiting Workington on Tuesday night. Despite having to cover a combined total of more than 670 miles in the space of just a few days, the Blues will do so in confident mood following a good week for the club. Darren Williams’ men ended an 11-game winless run with a fine 4-2 success over Ilkeston on Saturday, before following it up with a victory over Norton and Stockton Ancients in a behind closed doors friendly in midweek. “I was delighted with both the result and the performance in Saturday’s win over Ilkeston,” Williams told the Whitby Gazette. “After the run we have been on and the injury problems we have been suffering with, it was important that we got the result that we wanted. “Everyone was upbeat after the game and I’m really pleased for the players because they’ve deserved a win for a few weeks now. Town drew 0-0 at home to Halesowen last season, before sharing a six-goal thriller at the Yeltz’s Grove ground thanks to skipper Mark Robinson’s last-gasp leveller. The West Midlands outfit lost 3-1 at Whitby’s FA Cup conquerors Salford City on Tuesday night, but sit six points above the Blues in 12th. Saturday’s kick-off is 3pm. Tuesday night will see Town head across to Cumbria, where Workington provide the opposition, 7.45pm kick-off. 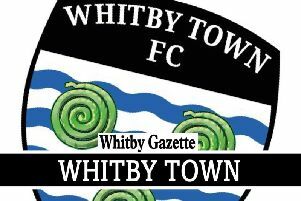 The Reds will also host Whitby in the FA Trophy on Halloween Saturday and will look to follow on from last term’s 3-0 success over the Seasiders, in the corresponding clash. Supporters’ coaches are running to both of the upcoming away fixtures. Transport to Halesowen will depart the Turnbull Ground on Saturday at 8.30am, while the coach to Workington leaves at 2.30pm on Tuesday. Contact chairman Graham Manser on 07966 241344 to book a place. The midweek friendly with Northern League outfit Norton and Stockton was arranged in order to give some of the players on the fringes of the Blues’ squad minutes on the pitch. It also afforded boss Williams the opportunity to cast his eye over new signings Thibault Charmey and Matthew Wyke, as well as a number of trialists. The Blues rested the majority of their first team regulars and trailed 1-0 at the interval after a disappointing first-half display, but a much-improved showing in the second period earned them victory. Former Middlesbrough, York City and Hartlepool attacker Ryan Brobbel was introduced from the substitutes’ bench at half-time and made a big impact, scoring two and setting up a goal for Wyke – another ex-Middlesbrough player. Midfielder Charmey, who made his debut for the Blues from the bench in Saturday’s win over Ilkeston, impressed the Blues boss, while two-goal Brobbel also made a favourable impression. “Thibault looked very composed on the ball, he worked hard, he’s technically very good and he gets himself into dangerous positions in the opposition half,” Williams added.